Nobody Previously Thought, or Could Have Thought, of a Dual Power. 2) govern the country until the Assembly meets. 3. In all political actions, troop units are subordinate to the Soviet of Workers’ and Soldiers’ Deputies and to the Committees thereof. 4. The orders of the Military Commission of the State Duma are to be obeyed, with the exception of those instances in which they contradict the orders of the Soviet of Workers’ and Soldiers’ Deputies (Emphasis in the original). The Provisional Government possesses no real power and its orders are executed only insofar as this is permitted by the Soviet of Workers’ and Soldiers’ Deputies, which holds in its hands the most important elements of actual power, such as troops, railways, postal and telegraph service. It is possible to say directly that the Provisional Government exists only while this is permitted by the Soviet. Yet if the Soviet had the support of the masses, whence came the authority of the Provisional Government which was recognised as the “official” government of Russia? The answer lies in the Soviet itself, which, on March 2nd, voluntarily relinquished its own power when it gave its support to the Provisional Government. For the Mensheviks who enjoyed the support of the large majority of Soviet delegates in the early stages of the revolution, this was just as it should be. According to their mechanical “Marxism”, the revolution which was underway could only be the classical bourgeois democratic revolution whose task was to destroy the remnants of feudalism in Russia and leave the way open for the development of Russian capitalism, which would, in the course of time, create the conditions for a proletarian, socialist revolution. Since the revolution was a capitalist one, the formula ran, it was up to the capitalist class to wield state power. For the supposedly socialist Mensheviks the Provisional Government was the natural source of authority. The only possible role for the soviets could be that of a kind of supervisor of the bourgeoisie to see that it carried out its democratic tasks. Though it did not want to see the role of the working masses reduced to that of a mere spectator or overseer of the capitalists’ revolution, the activity of the Bolshevik Party was also constrained by the theory of the democratic revolution. In the aftermath of 1905, which revealed the weakness and political spinelessness of the Russian bourgeoisie, Lenin had outlined the tactics for a socialist party in the forthcoming revolution in Russia. Far from abstaining from taking political power, Lenin argued that the Russian proletariat must ally with the peasantry to establish a “revolutionary democratic dictatorship” and so complete the bourgeois revolution. This in turn would be the prelude to proletarian, socialist revolution. Although this was an infinitely more dynamic perspective than the Mensheviks’, which took into account the fact that the class struggle between workers and capitalists already existed in Russia despite its predominantly rural population, it still placed the tasks of the bourgeois democratic revolution first on the order of the day. When the February Revolution broke out the Bolshevik Party’s Programme was still based on the idea that the first task was to complete the democratic revolution and the initial activities of the various Party organisations in Petersburg, no matter what their political complexion, reflected this fact. Thus the Bolshevik Manifesto drawn up in February by the Bureau of the Central Committee in Russia (Shlyapnikov, Molotov and Zalutsky), whilst continuing the policy of revolutionary opposition to the war, called on the working class and the revolutionary soldiers to form “a provisional revolutionary government” in order to establish a democratic republic which would introduce such reforms as the 8 hour day, confiscation of landed estates, the creation of a constituent assembly on the basis of universal suffrage and secret ballot. After the formation of the Provisional Government the first seven issues of Pravda, under the direction of the Bureau, denounced it as “a government of capitalists and landowners” and called for the Soviet to convene a constituent assembly to establish a “democratic republic”. The task of the moment is the founding of a provisional revolutionary government, growing out of the unification of local Soviets of Workers’, Peasants’ and Soldiers’ Deputies in the whole of Russia. full seizure of central power [and limited recognition of the Provisional Government ...] only until the formation of a revolutionary government from the Soviets of Workers’, Peasants’ and Soldiers’ Deputies and only in so far as its actions are consistent with the interests of the proletariat and the broad democratic masses. its actions correspond to the interests of the proletariat and of the broad democratic masses of the people. When Kamenev went even further in the pages of Pravda and undermined the entire Bolshevik policy on the war by unashamedly calling for national defencism on the basis that a free people can only “answer bullet with bullet, shell with shell” there was uproar amongst rank and file Party workers. The indignation in the Party locals was enormous, and when the proletarians found out that Pravda had been seized by three former editors arriving from Siberia they demanded their expulsion from the Party. necessity of gradually gaining political control and influence over the Provisional Government and its local organs so as to persuade it to conduct the most energetic struggle against counterrevolutionary forces, to take the most resolute steps towards a complete democratisation of all walks of Russian life, and to make preparations for universal peace without annexations and indemnities based on the self-determination of nations. Small wonder that many sections of the Party thought unification with the Mensheviks was now a possibility! Given the confusion inside the Bolshevik Party, it is a mistake to explain the soviets’ ceding of power to the capitalists as simply due to a low level of class consciousness as reflected by the Bolsheviks’ minority in the soviets. The February Revolution was the first to occur in the imperialist epoch. No party had, or could have had, a fully-worked out strategy for how the proletariat should conduct the struggle as part of a world socialist revolution. The Russian workers and soldiers had to learn for themselves how to struggle for full soviet power. The Bolshevik Party represented both the height and the limitations of class consciousness. The fact that those sections of the working class prepared to fight for soviet power as early as February were also Bolshevik strongholds is testimony to this. Thus, even somewhere like Vyborg, where the Bolsheviks had a majority in the local soviet from day one, the highly conscious workers found themselves in the contradictory position of calling on the Soviets to prepare for a full seizure of power at the same time as giving qualified support to the Provisional Government. So long as it was thought that “the fundamental problem is to establish a democratic republic” (first issue of Pravda), the demands for soviet power (i.e. power to the organs of the incipient workers’ state along the lines of the Paris Commune), and for workers to turn the imperialist war into a civil war (i.e. revolutionary class struggle), were inconsistent. Parliamentary democracy, based on elections by “the people” - i.e. exploiters and exploited alike - every few years, is the highest form of bourgeois democracy. But it is irreconcilable with soviet power which can only be meaningful when the working class has overthrown the capitalist state machine. Similarly, the interests of “the nation”, even in the most democratic of parliamentary republics, demand participation by the whole population in its wars of “national defence” against other capitalist powers. By the beginning of April the Bolshevik Party’s attempt to cling to its programme of democratic revolution, to reconcile the irreconcilable, had led to confusion on the question of the war and moves towards conciliation with the Provisional Government. Before the Party could once again lead the Russian working class firmly along the path of proletarian internationalism and political independence from the capitalist class, the old framework had to be abandoned and a new one developed in its place. This was the task Lenin had already begun in his Letters from Afar, only one of which had been published (with significant cuts) by Pravda. With his arrival in Russia he was in a better position to make his views felt. The astonishment of those who heard Lenin’s first speech at the Finland Station is well-known. The contrast between this and the direction the Party leadership had taken throughout March was certainly astonishing. Dear comrades, soldiers, sailors and workers! I am happy to greet in you the victorious Russian revolution, and greet you as the vanguard of the international proletarian army... The piratical imperialist war is the beginning of civil war throughout Europe... The hour is not far distant when at the call of our comrade Karl Liebknecht, the peoples will turn their weapons against their own capitalist exploiters... The international socialist revolution has already dawned... Germany is seething... Any day now the whole of European capitalism may crash. The Russian revolution accomplished by you has prepared the way and opened a new epoch. Long live the worldwide socialist revolution. The formula is obsolete. It is no good at all. It is dead. And it is no use trying to revive it. As for the general scheme of Comrade Lenin, it seems to us unacceptable in that it starts from the assumption that the bourgeois-democratic revolution is ended, and counts upon the immediate transformation of this revolution into a socialist revolution. No matter the existence of a new government in Russia, the war is till an imperialist war fought for the interests of capitalism. Given that broad sections of the masses are being deceived by the bourgeoisie into believing that the war can now be fought as a war of revolutionary defence the task is to explain patiently “the inseparable connection existing between capital and the imperialist war, and to prove that without overthrowing capital it is impossible to end the war by a truly democratic peace”. The Party must expose the contradictions between the Provisional Government’s words about “peace without annexations” and its actions. This campaign should also be carried on at the Front alongside appeals for fraternisation. The latter should aim “to raise fraternisation from the level of an instinctive revulsion against war to a clear political understanding of how to get out of it”. The Russian Revolution is now passing from its first to the second stage. The former, owing to “the insufficient class consciousness and organisation of the proletariat”, placed power in the hands of the bourgeoisie. The next stage “must place power in the hands of the proletariat and the poorest sections of the state”. No support for the Provisional Government. No breeding illusions that a government of capitalists can cease to be an imperialist government. So long as the Bolsheviks are a minority in the soviets the Party’s task is to explain the errors of the other parties who hold sway over the masses (Mensheviks, Social Revolutionaries) at the same time as preaching the “necessity of transferring the entire state power to the Soviets of Workers’ Deputies”. The weight of emphasis in the Agrarian Programme to shift to the soviets of Agricultural Labourers’ Deputies. Separate soviets of poor peasants. Confiscation of all landed estates and disposal of land by the Agricultural Workers’ Soviets “for the public account”. The need to convoke a Party Congress to change the Party’s Programme on the issues of imperialism and war; the nature of the proletarian state; the out-of-date minimum programme; and to change the Party’s name to the Communist Party. The need to take the initiative in creating a new revolutionary international. The Theses, starting from the reality of the imperialist war and the existence of the soviets, provided a strategy and tactics for a party that was aiming to lead the working masses in a socialist revolution. ... Its Elements Have Already Been Created by the Best Adherents of Bolshevism. Within a month the Party’s attitude towards the Theses changed from ridicule and hostility to their broad acceptance as the basis for the resolutions at the April Conference. It is too easy and simply untrue to explain this by Lenin’s charismatic leadership. Despite his undoubted standing in the Party his views on return from exile had been dismissed as unrealistic by the Central Committee. It was reality itself which was to force on the leadership as a whole the validity of Lenin’s perspective. In fact the Theses already reflected the feeling of rank and file members in districts like Vyborg and Kronstadt where there was no problem persuading the revolutionary workers and sailors of the need to oppose the Provisional Government and establish soviet power. In other words, Lenin was much more in touch with the revolutionary working class than many of the other Bolshevik leaders. But the longer the dual power situation lasted the more the folly of trying to pressurise the Provisional Government into acting in the interests of the masses became evident. While the ministers hummed and hawed about the fate of the landed estates, the peasants were already seizing the land. Immediately there were widespread demonstrations against Milyukov and the war throughout Russia. On April 21st 100,000 workers and soldiers in Petersburg demonstrated for peace. The Petersburg Soviet received resolutions protesting against Milyukov’s note from soviets all over Russia. During this April crisis, three days before the Party Conference, some local Party Committees (Kronstadt, Petersburg, Helsingfors) interpreted the slogan “Long live the Soviets” as a call for the immediate overthrow of the Provisional Government. 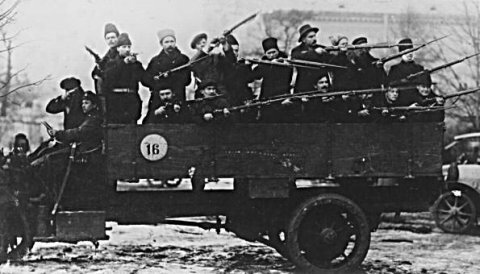 The Kronstadt Committee led armed soldiers and sailors to the peace demonstrations carrying the slogan “Down with the Provisional Government”. Even before the Party had formally adopted Lenin’s resolutions and accepted “All Power to the Soviets” as the guiding slogan of the hour, the Bolshevik Party was presented with a problem which would reappear in the months to follow: that of militant sections overestimating the political maturity of the situation and falling into the trap of rushing into a premature attempt at insurrection. But this was a problem of a Party intent on creating the best possible conditions for a successful assault on power. In the aftermath of the April crisis and the Party Conference the question the Bolshevik Party was asking itself was not whether the soviets should take state power but “How” and “When”. The bourgeoisie solved its political crisis by denying Milyukov’s note meant what it said and getting rid of its author. Now the Executive Committee of the Soviet came to the rescue by agreeing to enter a Coalition Government. Six so-called socialist Ministers were proposed by the Committee (S.R.’s and Mensheviks). On May 5th a Bolshevik motion to the Petersburg Soviet opposing the “socialist Ministers” received only 100 votes. Despite the growing influence of the Bolshevik Party it was still a long way from determining Soviet policy as a whole. At the beginning of May the Russian capitalists and their Allies still hoped to revive the crumbling war fronts and win back popular support for a new military offensive by involving the Soviet in its Government. Kerensky, the self- appointed spokesman for the Soviets in the previous Provisional Government, now became Minister of War and the Navy in this new attempt to dupe the masses by arguments about strengthening Soviet control over the Government. And as yet the masses were not conscious enough to realise that Soviet power was incompatible with such a Government; that it was impossible to force a peace policy on the agents of imperialism. As Trotsky put it, the feeling was that if one Kerensky in the Government was all right then six Kerenskys would be even better. But while Kerensky himself was informing Buchanan, Ambassador for British imperialism, that “the soviets will die a natural death”, the real socialists and revolutionaries, the Bolsheviks were answering the petty- bourgeoisie’s empty rhetoric about revolutionary democracy with the now clearly-defined policy of patiently explaining the “need for the entire state power to pass to the proletariat and semiproletariat”. The Party as a whole now accepted that its task was “to increase the number of Soviets, to reinforce them and to consolidate the unity of our Party” in preparation for victory over the capitalists which could not be achieved “in a few days by a simple outburst of popular wrath” or by premature adventurist acts, but which required organisation and, above, class consciousness - that is, the emancipation of the proletariat from the influence of the petty bourgeoisie.